Floor-skimming dresses were updated with panels of refined leather, all black, but still very feminine. Victorian lace bodices and sleeves were artfully covered in glitter, while some pieces were endowed with metallic floral embellishments, or a bow tie. The collection varies from the quite sinister part of cleanly cut leather capes, tunics, trench coats, skirts and dresses to the really dark-style square necked scallop hemmed black gown at the end. After the ‘metal and leather’ part comes ‘folk’ – the ethos style with rather oriental carpet pattern coats and full-sleeved dresses. 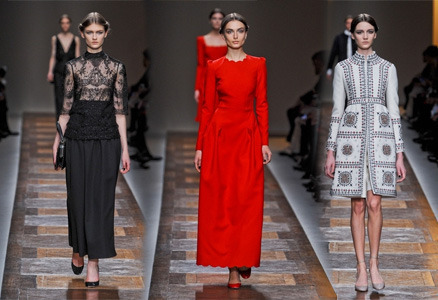 Some classic Valentino-red dresses with accentuated hiplines had a touch of ceremonial vestment to them. Lurex, some paneling, detailed hand embroidery and beadwork appeared after the layers of chiffon and much longer length skirts. These more smooth touches balanced with the unique femininity that Maria Grazia Chiuri and Pierpaolo Piccioli have made their trademark since taking over at the house perfectly, making us forget the previous love to the flaked tulle orlace garlanded with decorative flowers on chastely-shaped dresses from the last seasons.